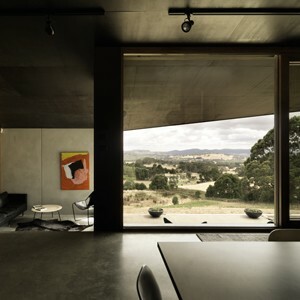 House at Hanging Rock by Kerstin Thompson Architects has been crowned winner of the prestigious Robin Boyd prize for Residential Architecture – Houses (New) at the 2014 Australian Institute of Architects’ National Architecture Awards. The house sits comfortably with its landscape, defined by three terraces staggered in plan and stepped down the site along a gentle diagonal. Interior and exterior spaces are cleverly organised through a series of parallel bands. The formal arrangement of the house frames desirable views – distant ones of hanging rock, and closer ones of bush land. According to the awards jury, the intimate house with a sheltering interior is a space in which you can linger all day, enjoying the distant views and landscape. The project triumphed over Australia's favourite new home, Oxlade Drive House by James Russell architect, which won a National Award in the category. “Located on a picturesque rural site, House at Hanging Rock nestles into the steep slope with a view to its namesake," the jury comment. "The house is divided into three parallel terraces, each in step with the landscape. Raw insulated precast concrete walls define the terraces and draw the eye through the house to the old growth forest to the east. Narrow timber shutters within the walls artfully connect the prefabricated panels and allow for cross ventilation and views to the valley. "The widest of the three terraces houses the central living zone and overlaps with the outer two terraces, creating a series of interconnected living spaces that are experienced as one larger space. Changes in floor height are exploited as thoughtful, informal seating moments and display areas for the client’s extensive art collection. "Dedicated circulation space is limited to the compressed entry foyer, heightening the sense of delight when entering the living space. Elsewhere passage is from room to room, further enhancing the spatial efficiency of the plan. "An elegant, sloping rhomboid roof covers the whole building, uniting the terraces, providing generous covered outdoor areas and further blurring the line between house and landscape. The sloped building form appears vastly different looking up from the valley compared with approaching from the side. "Stringent bushfire requirements are seamlessly integrated and inform the brutalist approach to material selection. The restrained interior material palette of concrete, armourply and formply is meticulously detailed yet remains humble and appropriate to the rural setting."